One is practical as they are a nice tool to help you to identify your pet. In addition to engraving your cat’s name on the collar (or on a charm or tag that you place on the collar), you can also put contact information in the event your pet ever gets lost. The second one is stylistic. Your cat can make quite the fashion statement by wearing a designer pet collar. And even though many designer pet collars are more expensive than your average cat collar, you can still find good pieces at affordable prices. Also remember that a designer cat collar makes a cat lover gift that is both useful and fashionable. Below you will find several cat collar suggestions and gift ideas to help you narrow your search. Rhinestone cat collars. These types of cat collars are fun yet chic. They are the perfect accessory for the feline fashionista. You will find many options to choose from: Elegant pet collars decorated with crystals, necklaces adorned with brilliant colored-stones, and simple collars enhanced with one or two rhinestones. Fancy. If you (and your cat) favor a more original piece, consider a fancy pet collar. These collars usually have a unique design. You will find pieces that come with one or several charms, bells and bows. You will also find collars that are made of unique materials, such as patent and denim. Lastly, these items come in a wide selection of colors and come in different sizes. Simple but sophisticated. You can certainly find simple cat collars that are of high-quality. This is the perfect solution for a cat who likes the simple, finer things. Many of these cat collars have built-in safety features. For example, some collars allow your cat to breakaway in case the collar gets stuck and some also glow in the dark. Personalized. Many online pet stores allow you to personalize your cat collar. What a great idea! If you want a cat collar that is stylish and fun, you’re in luck. You will find designer cat collars in different materials: leather, bright-colored fabrics and faux fur – among others. You will also find pet collars in different sizes. Make sure you select the right size for your cat. 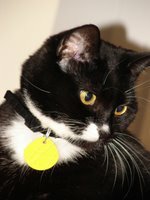 Our cat collars page gives you several tips to help you select the correct pet collar size. I hope that you find the information on this page helpful in finding the perfect designer pet collar for your cat.